Members of the Grand Junction Police Department Bomb Squad control a robot while disposing of 20 to 25 pounds of old dynamite that was on a property just south of Interstate 70 in Palisade. Here are a few photos of the multiple agencies at work during today’s incident. For more information about what happened during the incident please read the previous posts on this blog. 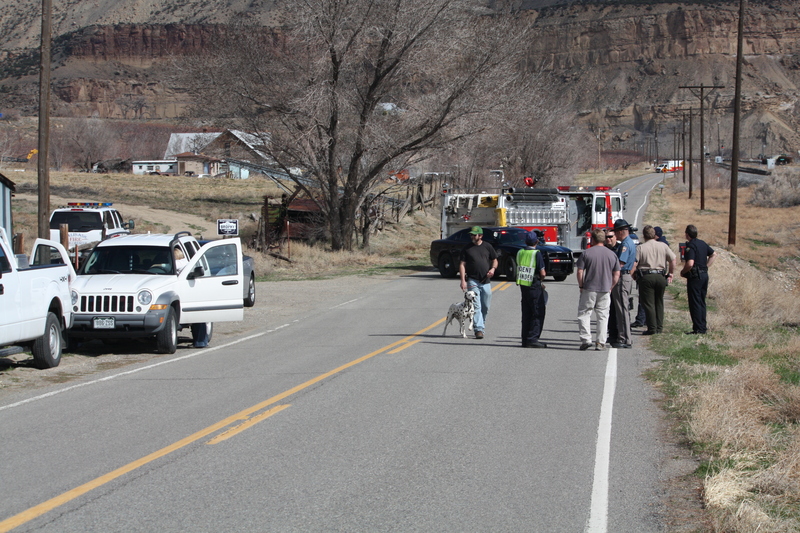 Traffic from Interstate 70 was rerouted through Palisade until the dynamite was rendered safe. 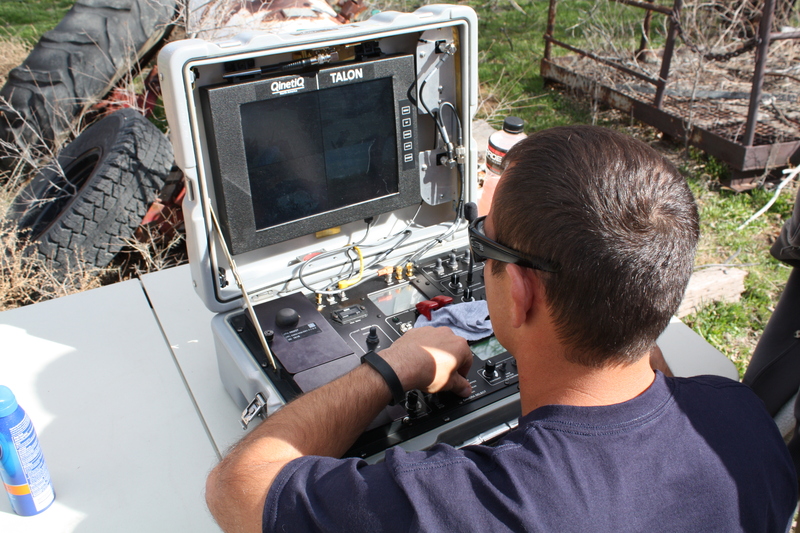 A bomb technician maneuvers the bomb robot into place and monitors the situation via a video camera on the robot. At 2:18 p.m., law enforcement on-scene in Palisade in the 3800 block of G 7/10 Road gave the official okay to re-open Interstate 70, in both directions. There may be a short delay with coordinating the opening of the Interstate near Palisade, but after 2 hours, the flow of traffic should be back to normal. 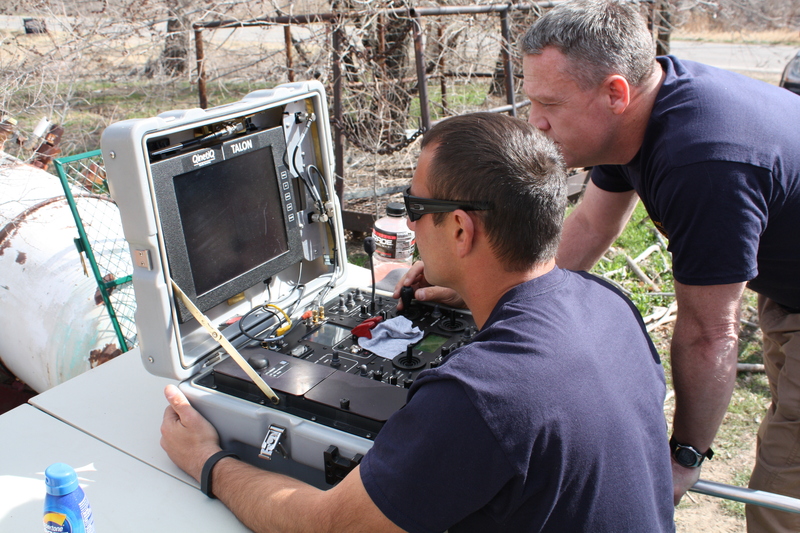 The Grand Junction Police Department Regional Bomb Squad rendered the dynamite safe, which was found on private property. This was not a criminal incident but rather a safety issue. 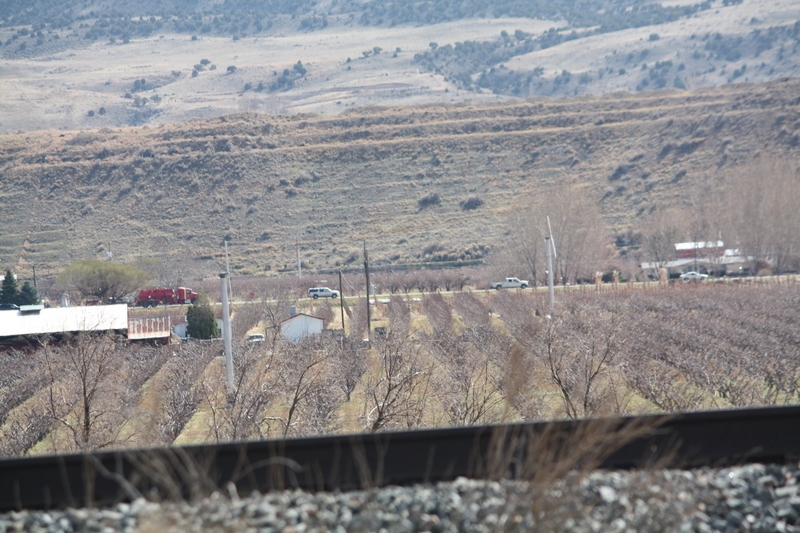 Multiple law enforcement agencies were involved in this incident, along with Palisade Fire Department and Colorado Department of Transportation. While some law enforcement will remain on-scene for a short time, the incident is complete and no further updates will be provided on this site for this incident. I-70 will be closed at exit 42 and exit 44. These exits are both of the Palisade Highway exits, more commonly known as the “Town of Palisade” exit and “east” Palisade exit. ****Media can stage at 3862 G 7 1/10 Rd. Interstate 70 will be closed in both directions for the next 3-4 hours today between the Palisade and Clifton exits (mile markers 42 and 44). The Grand Junction Bomb Squad was called out to remove several pounds of old dynamite that had been stored on a property in the 3800 block of G 7/10 Rd. The property is near the interstate. Bomb Squad technicians are utilizing methods that will hopefully minimize the chance of an explosion, however the possibility still exits that the dynamite could detonate. Should that happen, there is concern that rocks from the Bookcliffs could dislodge and tumble onto the interstate. Because of that, the Bomb Squad consulted with C-DOT, and it was decided that closing the interstate during this process was necessary to ensure the safety of drivers. The detour route for I-70 drivers will utilize Hwy 6 between the Palisade and Clifton exits. Community notifications have been sent to nearby addresses as well as to those who have signed up to receive road closure information through the Community Notification System. There is no need to evacuate any addresses at this time. We will continue to update this blog with information throughout the day.